When your power source is always changing position, you have to be crafty about how and where you place solar modules. 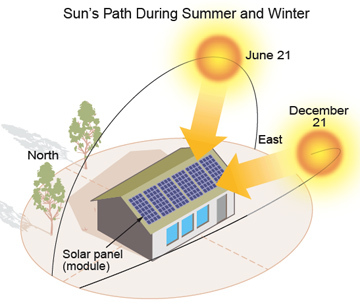 Understanding the tract of sun across the sky in every season enables a PV system designer to determine the most efficient orientation for an array. Shading from trees and other objects represents a huge challenge, but there are ways to mimimize its impact. Installing PV modules with the right compass orientation and tilt towards the sun is both a simple and complicated process. Simple, because the sun spends most of its time in the south, where a portion of your roof is probably already pointed. Complicated, because the sun doesn't climb very high in the sky between October and March. Its lower trek limits the amount of sunshine absorbed by the solar cells. Even worse, nearby trees and other obstructions will cast longer shadows whenever the sun is low in the sky. Shade is the kryptonite of solar power. Electricity production stops dead in its tracks whenever sunlight is blocked from reaching the module glass. Of course, fleeting bits of shade on the outer edges of an array is not a big deal. But if tree shade shrouds an entire module at high noon, and that module is wired in series with other modules, the whole kit and kaboodle of kilowatt generation may be vanquished in a heartbeat. That’s why choosing the right location for your array is a huge deal. The first solution that comes to mind for anyone new to solar electric systems is a motorized tracking device that keep modules in step with the elusive orb. Unfortunately, that requires a tilted array with swivel room to move back and forth. Most homes have modules installed flush across a sloping rooftop, so tracking’s not an option. Instead, a shade assessment must be undertaken, along with measurements of the dimensions and pitch of the rooftops. Then, from the information gleaned, it’s possible to estimate how many kilowatt hours will be generated by the array over the course of the year, and which spot on the roof will deliver the highest output. 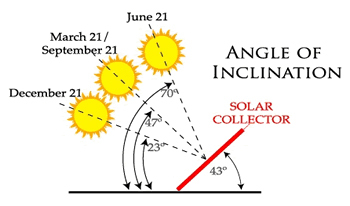 PV designers refer to the sun's position in the sky as the solar altitude angle. In tandem with its daily movement from east to west, this trajectory must be plotted yearround in order for any shading scenario to be identified. Sun path charts and measuring devices are needed to get the whole picture, since the day you go out to check for shade won't reflect what's happening six months down the road. For an introduction to sunpath tracking, watch this YouTube video. To estimate the annual power production for the array, you can look up the average number of daily peak sun hours for your city online. The National Renewable Energy Laboratory (NREL) publishes free data sets about solar radiation in U.S. cities. This map provides an estimate of peak sun hours for daily solar power generation in different parts of the country. The variable "kWh/m2" stands for kilowatt hours per square meter, a standard measurement used in solar calculation that's synonymous to peak sun hours. The National Renewable Energy Laboratory has collected extensive data on the performance of PV panels, which makes calculating optimum orientation and projected AC output a virtual walk in the park. Data sets like this one allow solar designers to calculate the power output of a solar array based on the available sun hours at five different tilt angles. In this example, PV modules facing due south in Sacramento get their maximum power generation (5.9 hours a day) by tilting the array at the same angle as the latitude of the city (which is 38.5 degrees).To download a chart for your city, use this page. System designers can calculate the optimum placement and tilt angle for an array based on the sun path data provided by the NREL. The goal here is to find the closest orientation to true south, with the least amount of shading, and a rooftop or ground mount that can be tilted up to face that direction. since most homes have rooftops pitched between 25 and 40 degrees, an array mounted flush to the roof will usually get the job done. The site assessor will take measurements, then crunch the numbers to determine how much electricity can be generated annually from that location by a certain number of modules. Rule #1: Residential fixed panels (aka the solar modules) generate the most power when tilted at an angle equal to the latitude of your city. For example, if you live in Los Angeles, whose latitude is 34 degrees North, you'd want to tilt your array about 34 degrees up from the ground for best results. The angle at which an array is tilted off its surface mounting is known as the array tilt angle. If you you're using a flat mounting surface (e.g. a ground mount or carport), you'll want to purchase tilted racks that can be adjusted to about 34 degrees. For a sloped roof, you should measure it to see if it's the ballpark. If you find that the roof pitches less than 30 or more than 40 degrees, it may be necessary to use a solar software application to calculate the insolation lost at that angle. The rooftop may still be good to go, but you should consider installing an extra module or two to make up the difference. One way to measure the angle of a roof slope (aka its incline or pitch) is the rise and run method. This requires a level, square, ruler and/or tape measure. You can either stand on the roof, or climb a ladder along the side of the house where you can measure the roof profile (as shown above). Create a right triangle with your tools, with the 12-inch ruler parallel to the ground, and the square held at a 90-degree angle. (Here's a video that demonstrates how to do this.) What you're looking for here is a ratio. For every 12 inches of run, there's "X" number of inches of rise. Once you've got the two measurements, divide the rise by 12, then use the arc tan key on a scientific calculator to determine the tilt angle in degrees. Rule #2: Modules should face as close to true south as possible. 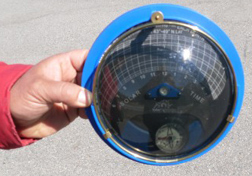 Whereas the array or roof tilt angle involves an altitude or vertical measurement, there's also the compass direction to consider. 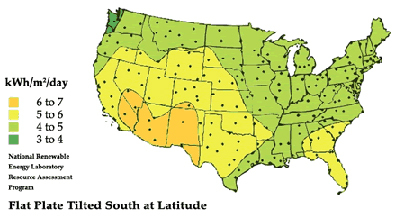 As stated earlier, true south is considered the ideal orientation for a fixed-panel array. That's because the sun spends its peak hours in the south shining down on the Earth. 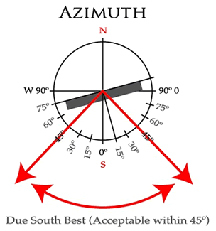 This compass direction is referred to as the solar azimuth angle. In solar design, when assessing a roof or other array mounting location, south is always used as the reference direction. Instead of its usual compass bearing of 180 degrees, the reference is marked at Zero. The bearing is expressed as the number of degrees east or west of true south. For example, 15 degrees east of true south is the same as 165 degrees on a compass. Note: True south is different from magnetic south because of the phenomenon of declination, which is explained on the next page. While not all rooftops have sides that face exactly south, an array orientation within 45 degrees (+ or -) of true south will still generate plenty of power in latitudes below 50 degrees. 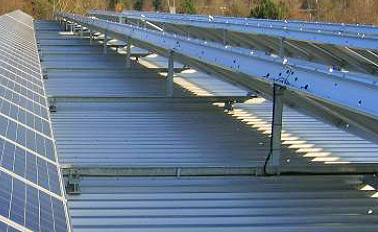 Rule #3: To increase electrical output from solar modules on a flat roof or ground mount, it's better to install racking with a tilt adjustment. Needless to say, the nature of a "fixed panel" means that a solar array's tilt angle typically remains the same year-round. Yet there are a number of mounting systems on the market today that include a manual "tilt adjustment". This allows you to increase an array's electrical output by 25 percent or more simply by making a trip up to the roof (or other array location) three or four times a year to turn a wrench. Motorized tracking systems are also available, but these cost a ton of money and require frequent maintenance because of their moving parts. However, modules installed flush (i.e. level) on the standard sloping roof are not adjustable. Rails are used as the mounting system, an inexpensive alternative to triangular racking. February 5th - Set array to same angle as your latitude. May 5th - Set array to your latitude minus 15 degrees. August 5th - Set array back to same angle as as your latitude. November 5th - Set array at the angle of latitude plus 15 degrees. Rule #4: Avoid placing an array where significant shading will block out sunlight. As already mentioned, shading from a nearby tree or building is a real showstopper for PV power production. Vents, ductwork and roof chimneys will all create shadows at some point during the year (or every day). A few weeks of shading across a few outer modules may not sound catastrophic, but if an entire row of shaded cells in just one module gets shaded, it can trigger a huge voltage drop throughout the PV circuit. To understand how a cascading power loss occurs, think of your solar modules as if they were all trains on a subway line. When one train breaks down, all the other trains slow to a crawl. So unless safeguards are put in place to prevent it, the wattage output from an array can plummet when there's one shaded module. This is one reason why shading assessments are required for all solar array installations. In fact, many rebate programs and tax credits are predicated on an 80-90% shade-free array. 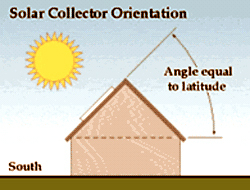 Shading reports are typically generated by one of two devices, the Solar Pathfinder and the Solmetric Sun-Eye. Both devices cost anywhere between a few hundred to a few thousand dollars. Both come up with software that can spit out a detailed report explaining the shade risk and anticipated power output based on the annual sun hours. A site assessor usually takes multiple readings to assess shade - normally each corner of a proposed array location and one or two spots in the middle. Several different tools and devices are available to predict shadows over the course of a year. 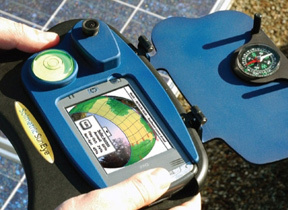 These include two specially designed gadgets known as the Solar Pathfinder and the Solmetric Sun-Eye. The Sun-Eye includes a built in camera and computer. If you don't want to spend the money to purchase either of them, you can try conducting the shade assessment manually. Measuring and mitigating against shade is covered in-depth on Page 3. For links to popular measuring tools, interactive forms, sortware apps and other tools, be sure to check out our Calculators page. Rule #5: Consider other variables particular to the site. In some humid locations, summertime brings more cloudiness than in winter, which has clearer skies. Orienting an array so that it favors the winter sun may result in more power output for the year. Where winters are persistently cloudy, it may be more advantageous to focus on the summer sun for power. In this scenario, the modules should face more to the southwest and have a smaller tilt angle, since the sun stays high in the sky throughout summer. Some homeowners want more energy produced during peak usage times in the late afternoon hours, when utility rates are higher. In this case, an array may be positioned to the southwest. Conversely, for a business or industrial location that wants to rely on solar energy, more power may be needed in the morning. In this case, the array should be pointed more towards the east.